Knights of Creativity Spirit & Ale: Endeavor to Dream -- BIG! My father loved history -- especially military history. So, when my mom and dad took a trip to the west coast, they stopped to see something called the "Spruce Goose." The flying boat, built by Howard Hughes, one of the most eccentric men who ever walked the planet, was the epitome of dreaming big. Really big. It was on this date in 1947 that the Spruce Goose took flight -- if only for a mile! Following the U.S. entrance into World War II in 1941, the U.S. government commissioned the Hughes Aircraft Company to build a large flying boat capable of carrying men and materials over long distances. 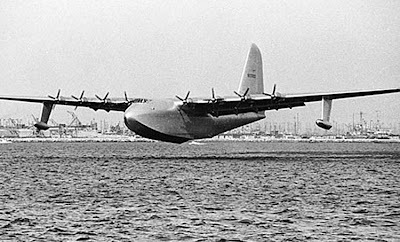 The concept for what would become the "Spruce Goose" was originally conceived by the industrialist Henry Kaiser, but Kaiser dropped out of the project early, leaving Hughes and his small team to make the H-4 a reality. Because of wartime restrictions on steel, Hughes decided to build his aircraft out of wood laminated with plastic and covered with fabric. Although it was constructed mainly of birch, the use of spruce (along with its white-gray color) would later earn the aircraft the nickname Spruce Goose. It had a wingspan of 320 feet and was powered by eight giant propeller engines. Development of the Spruce Goose cost a phenomenal $23 million and took so long that the war had ended by the time of its completion in 1946. The aircraft had many detractors, and Congress demanded that Hughes prove the plane airworthy. On November 2, 1947, Hughes obliged, taking the H-4 prototype out into Long Beach Harbor, CA for an unannounced flight test. Thousands of onlookers had come to watch the aircraft taxi on the water and were surprised when Hughes lifted his wooden behemoth 70 feet above the water and flew for a mile before landing. Despite its successful maiden flight, the Spruce Goose never went into production, primarily because critics alleged that its wooden framework was insufficient to support its weight during long flights. Nevertheless, Howard Hughes, who became increasingly eccentric and withdrawn after 1950, refused to neglect what he saw as his greatest achievement in the aviation field. From 1947 until his death in 1976, he kept the Spruce Goose prototype ready for flight in an enormous, climate-controlled hangar at a cost of $1 million per year. Today, the Spruce Goose is housed at the Evergreen Aviation Museum in McMinnville, Oregon (end). 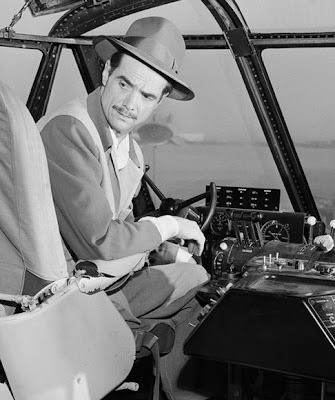 Howard Hughes, now there was a man of big dreams and passion. Thanks for reminding me about that... i used to read about this as a kid and wonder why people didn't get behind such a great idea as landing big planes onto water. I like seeing normal seaplanes take off and land and this must have been awesome in its day. Has nobody in the States thought of trying to get this thing up in the air again?. HH did dream big...and was ahead of his time and technology and i always thought he cut a sad figure, a prophet unhonoured in his own land....maybe he was tooo ahead of his time , but i always felt as if the American government was against him It helped being super rich...of course. Its a shame the whole thing got to his mind in the end, it must be hard to have real friends if you are that rich. from the other part of crazy passion on Greenbriar! Living passion crazily is always easier when you treat one million like one dollar!